Looking for new West End Vancouver condos for sale? Check out the new Amacon Modern Vancouver Condos located at Burrard and Harwood, the best location in the West End Vancouver real estate market! The actual address of this new project is at 1001 Hardwood Street Vancouver and the grand opening is Spring 2012. The Amacon Modern Vancouver condo building will be a significant landmark tower of 19 storeys, a first in the West End Vancouver real estate market in decades! There are only 118 limited opportunities at the new Amacon MODERN Vancouver West End condo project! The diverse selection of floor plans, homes and finishings will make this a very popular downtown Vancouver condo project in 2012. The floor plans at MODERN Vancouver condos for sale will include studio residences to very large 3 bedroom Vancouver West End penthouses for sale. The layouts at the West End Vancouver MODERN condos will be very open concept and expansive, allowing for you to live, grow and enjoy the spectacular views of the downtown skyline and the water. The 21st century dynamic tower will bring the first fresh tower residence to the West End Vancouver real estate market in more than 10 years, so the preconstruction Vancouver MODERN Amacon condos will certainly be sought after by first time homebuyers to singles and couples and from upsizers to investors. The Burrard and Harwood location is also impeccable as you will be centrally situated within the most desirable downtown Vancouver neighbourhood within walking distance to tree lined streets, Yaletown, English Bay, Robson Street, Granville Street Entertainment District as well as the Seawall. Public bus system and other transit routes are also nearby the West End Vancouver MODERN condos by Amacon Developers. Inside these MODERN Vancouver condos in the West End neighbourhood are spectacular Bosch appliances as well as engineered hardwood floors in living spaces. The carpets at the new West End Vancouver MODERN condos by Amacon will be wool and located in the bedrooms. Another added bonus for these preconstruction Vancouver MODERN Condos in the West End neighbourhood is that each home has cooling and heating. For more information, please refer to www.amacon.com or you can register with the Buzz for the latest VIP sales launch information. This is THE Vancouver West End condo project to be excited about. 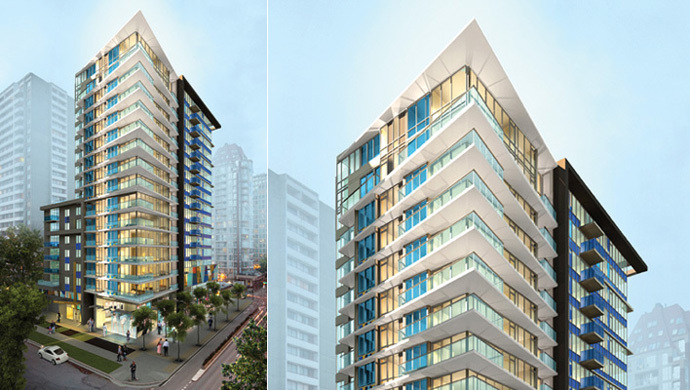 Introducing the Amacon MODERN Vancouver West End Condos. In addition, the deposit structure (which we know is very important for many first time homebuyers as well as condo investors) includes only a 10% initial deposit upon presentation of an offer with an addition 5% due on March 1, 2013. This is inline with other presales Vancouver condo projects. Also, a final 5% is due on December 1st, 2013. The estimated completion date for the Amazon Modern Vancouver West End condos is for Spring 2014. The prices above can change at any time and do not include GST/HST. Here are some quick facts about the new Amacon Modern Vancouver West End condo tower: the project will be built to LEED Gold equivalent certification with dual flush toilets, water efficient fixtures throughout as well as double glazed, low E glazing system and highly insulated walls and roofs. Also, other LEED Gold features include low VOC finishes and low emitting materials in the building construction in addition to a building recycling system. Also, the close proximity of the Vancouver West End real estate neighbourhood to everything you need is another added bonus. The building itself will have a landscaped podium courtyard with children’s play area and an urban agricultural plot area for resident use only. Also, the MODERN Vancouver West End condos will also have a fitness gym with cardio and weight equipment in addition to tecn ready CAT5 wiring and multiple pre-wired connections for high speed cable and ADSL. The homes come with the 2-5-10 year home warranty by Travelers and there is restricted floor access in the elevators and stairwells in the building. The Amacon Modern Vancouver condos will also have double gated garage entry and secured keyless garage and entry lobby. The modern architecture at MODERN by Amacon Vancouver condos is by IBI Group and there are two colour schemes to choose from that includes the ‘Burrard’ or ‘Hardwood’ and they are selected and designed by award winning Portico Design Group specifically for the new West End Vancouver Modern condo tower. Also, all homes have front loading GE energy star Washer as well as a dryer that is vented outside as well as custom fit designer roller shades for privacy. Other interior suite features include 100% wool carpets in tehb edrooms as well as premium engineered hardwood floors in the entryway, kitchen, living and dining room. All homes have heating and air cooling systems too, which is very unique for a downtown Vancouver West End condo. The bathrooms at MODERN Vancouver condos will have slender one piece Caroma dual flush water conserving toilets as well as polished porcelain large format 12” x 14” tiles. The baths will also have chrome German engineered Grohe fixtures, polished stone slab counters and custom flat panel wall vanity. The gourmet kitchens at the Amacon Modern Vancouver West End condos will feature durable laminate flat panel square edged cabinets, exclusive stainless steel appliance package by Bosch, Fisher Paykel and Panasonic in addition to chrome German engineered Grohe dual spray pull down faucet and a stainless steel double bowl undermount sink. Amacon has always been well known for their landmark developments that push the limits in high-end design, good location and impeccable craftsmanship and customer service. There are lofty expectations for the new West End Vancouver MODERN Condos that will represent one of the few new projects in this most sought after neighbourhood. Demand and interest are high for new Vancouver West End Condos as inventory has been depleted by years of development silence and rental apartment restrictions. But here, the Amacon MODERN Vancouver West End Condos represents the best and singe most attractive preconstruction Vancouver downtown condominium development in the past 15 years with price points starting from just the mid $300,000’s. The scheduled and estimated completion date for the new West End Vancouver MODERN Condos is slated for mid 2014, and the project location is at 1001 Harwood Street Vancouver Downtown real estate market. The MODERN Vancouver sales centre, however, is now located on site, but is at 1305 Burrard Street Vancouver and they are opening mid April 2012 with presentation centre hours between 12 noon and 5pm. With the purchase price starting in the $300’s range, it is also expected that these MODERN Vancouver condos will include parking as well as storage lockers with the price. All HST Rebates and new homebuyers rebates are applicable to any of these purchases. The West End Vancouver MODERN Condo high-rise will be 19 storeys in height and will offer a total of one hundred and eighteen (118) market suites for sale in spring 2012. The builder is Amacon Develops, a local builder with a lot of experience in multi family housing projects. The architect for the truly MODERN Vancouver West End high-rise is IBI Group, another notable award winning team member for this Amacon development. As well, the West End Vancouver MODERN Condos will have interiors designed by Portico Design Group, also winner of multiple industry awards. We call it the 3 ‘A’s …. For AMAZING. The builder for the MODERN Vancouver West End condo tower is Amacon, one of our favourite boutique builders who has a long history of successful, unique and high-end developments at great prices. The amazing project at the West End Vancouver MODERN Condos is all about superior interior finishes, finely crafted spaces, functional layouts and impeccable detailing throughout the homes. The amazing location is in the West End Vancouver real estate district where you will find this MODERN Vancouver condo tower that is unlike anything else you have ever seen. The West End Vancouver community is well known for its excitement, nightlife, residential areas, close proximity to services/amenities, the water, parks and trails as well as old apartments. But now with the ultra new Vancouver MODERN West End condo tower by Amacon Builders, homebuyers have a chance to purchase a brand new West End Vancouver condo that is so hard to come by. The walkable neighbourhood is close to everything downtown. The SkyTrain, bus routes, Aquabus and more are all within a walk away. The 17 storey residential tower at MODERN by Amacon Builders here in the West End Vancouver real estate market is all about convenience with a location situated at 1305 Burrard Street Vancouver Downtown. The sleek and elegant high-rise building will be sophisticated, well designed and ultra high-end for today’s homebuyer. With prices starting from the mid $300k range, the new Amacon MODERN Vancouver West End condo tower will feature a liveable neighbourhood coupled with floor plans starting from one bedrooms that include parking. Inside the kitchens, home buyers will find stainless steel Bosch appliance package, roller blinds on all windows for added privacy and shade as well as polished stone counters and engineered hardwood floors. As well, every new Vancouver MODERN West End condo will be fully air conditioned. Most of the homes will have outdoor spaces and residents can also enjoy the 10 floor rooftop deck with views and open air lounge areas. According to the sales and marketing team at the Amacon MODERN Vancouver West End condo tower, “Modern is the first new downtown tower that is been built west of Burrard and so close to the Seawall in a long, long time.” Sometimes called the “Celebration Route”, Burrard is also a very popular choice to honour life’s wonderful moments from all the parades and other community events. The Amacon MODERN Vancouver West End condos will only number 118 opportunities including 5 two storey MODERN penthouse suites for sale that will feature 16 foot ceiling heights! These new Amacon Vancouver MODERN Penthouses will also feature private roof decks with great views. Located at Harwood and Burrard in the heart of Vancouver’s West End you’ll discover Modern, Amacon’s exciting new boutique high-rise that will redefine practical and sophisticated living. Rising 17 storeys, Modern Vancouver West End condos will offer a limited collection of 118 residences ranging from intimate Jr. 1 bedrooms starting in the mid $300’s to exclusive two-level penthouses. All downtown Vancouver West End homes at Modern by Amacon will include 1 parking stall, in-suite air conditioning, high-end full size stainless steel appliances and contemporary finishes by award winning Portico Design. Register at www.amacon.com.